I must have been spacing when I looked at a two-pound bag of dried chickpeas and decided that would be sufficient for a couple portions of hummus. I soaked all 2 pounds overnight and woke up to about 20 pounds of chickpeas. Even after making 3 different types of hummus and one portion of falafel, I had to freeze a few cups. I don’t know if that’s advisable; I guess we’ll see when I thaw them. 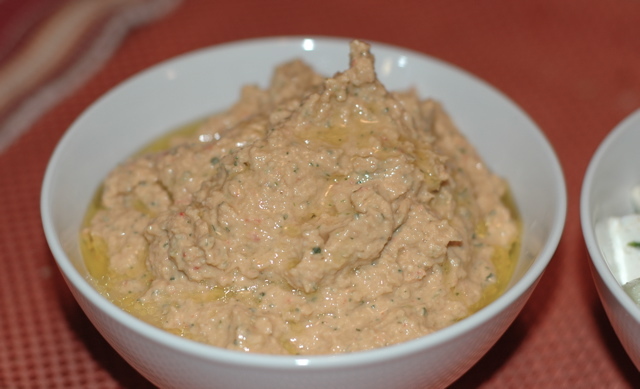 The basic hummus recipe I use comes from my first cookbook (and still one of my favorites). A couple variations include using sun-dried tomatoes and roasted sweet peppers. If you want to use dried chick peas, they must be soaked overnight first. Then boil them in plain water. DO NOT add salt, otherwise the chickpeas will not get tender. I learned this the hard way. Put all the ingredients in a food processor and blend until you have a smooth paste. If the paste is too dry, you can add a little water or olive oil while it’s blending. I like to add a drizzle of olive oil, a squeeze of lemon and a dash of cayenne just before serving. Variation #1: add 1 cup chopped sun-dried tomatoes (the kind stored in oil). Variation #2: add 2 roasted red, orange or yellow bell pepper. I don’t recommend green, as they aren’t as sweet. Sometimes I buy roasted bell peppers in a jar, but I occasionally do it myself because I have a gas range top. I put the peppers directly on the burner and allow each side to char. It takes maybe 10 minutes. The I throw the peppers into a large Ziplock bag and allow to cool enough to handle. The skin then peels right off. Remove the seeds before using.